Both Andre Van Reese and Kane Nelson are no strangers to the Trance scene, their single 'Bang!' 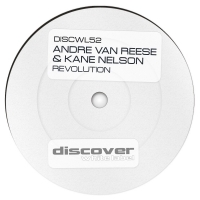 was a massive track on Discover Digital and now they return, this time to Discover White Label with 'Revolution'. Clocking in at just under 8-minutes long, 'Revolution' is an acid-lead beast of a track. "We are talking about a society in which there will be no roles, other than those chosen, or those earned." - this is the Revolution in action.